Gotta love the latest Black Sheep Kia Soul ad that’s been running. Love the hamsters, and I love the toaster that some of them are driving around in. Too funny. I’m not sure who is doing the Kia advertising, but it’s just been fantastic lately. The Soul ads and the Sorento ads. Well, not really my realtor, but the realtor that’s supposedly trying to sell the condo that we’re renting. She was performing on the local morning new show here in Austin. She’s also in the new Robert Rodriguez movie Machete. There is a new exhibition open at the De Young Museum in San Francisco called Birth of Impressionism: Masterpieces from the Musée d’Orsay open till September 6th. I would love to be able to see this if we were still in the city. 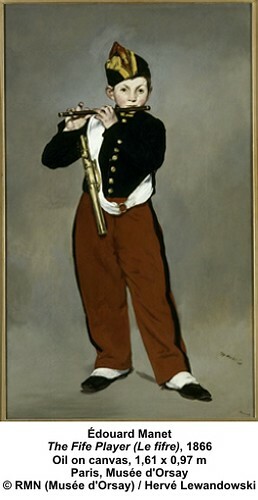 It’s got some notable peices such as The Fife Player by Manet, Rue Montorgueil, Paris. Festival of June 30, 1878 by Monet, and The Floor Scrapers by Caillebotte. This is quite a coup for the city to be the only location of this exhibit. There is also a seperate exhibit open in the sister museum, The Legion of Honor, called Impressionist Paris: City of Light which also looks impressive. A few years ago we were in Paris and got a chance to go the Orsay. It is quite an amazing collection of work that has been assembled, and the venue, which is an old remodeled train station, is equally fantastic. The main drawback is all the people that view it through the viewfinder of their camcorder. At that point, since you’re not really looking at it, you may as well just buy the catalogue from the museum store.